Pictured from left to right is Diane Pol, Cole Spicer, Dr. Jan Pol, and Charles Pol. Cole Spicer, age 7, son of Randy and Lianna Spicer, of Spicer Ornamental Bird Farm, in Solon Township, traveled with his copy of the Post to see his friends the Pols on January 21. The Pols are a famous veterinarian family in Weidman, Mich. Dr Jan Pol and his family own a clinic that is recorded by National Geographic Wild as the “Incredible Dr Pol show.” Spicer Ornamental Bird Farm was featured nationally on National Geographic Wild in season nine, episode 1. She said Cole is a big helper on their bird farm. His duties include gathering eggs, and helping feed and water. He also helps move the peachicks when they hatch from the incubator to their brooder. “Cole loves his animals and is on his way to becoming quite the hobby farmer,” she said. 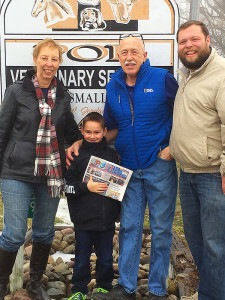 Thank you, Cole, for taking us with you on your trip to see Dr. Pol!